Shingles, or herpes zoster, is caused by the same virus that causes chickenpox. The virus can lie dormant in the body for many years and re-emerge as shingles. 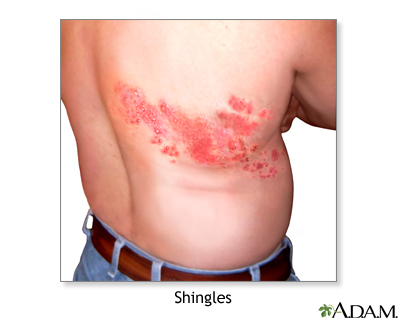 Shingles appear as a painful rash. It consists of red patches of skin with small blisters (vesicles) that look very similar to early chickenpox. Shingles usually clears in 2 to 3 weeks and rarely recurs.